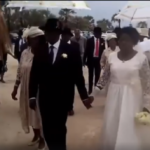 THE Okahao Lutheran parish in the Omusati Region hosted this Saturday what can rightly be described as Namibia’s most notable wedding of the year. The bridegroom was none other than the 83-year-old business personality Frans Aupa Indongo. The bride was the 63-year-old Beata Ankonga. The couple were married by emeritus Lutheran Bishop Kleopas Dumeni during a colourful event attended by among others, Prime Minister Saara-Kuugongelwa-Amadhila, King Johannes Mupiya of Ongandjera, Chief Herman Iipumbu of Uukwambi, business personalities, relatives and friends from all walks of life and from different tribes and racial groups. From the church the newly-wed couple and their entourage headed to the bride’s home village of Uukwandongo, about five kilometres south of Okahao town, where the first reception was hosted before the wedding-goers drove about 70 kilometres to Oshakati where the main reception was held at Indongo’s Continental One complex. Frans Aupa Indongo (a Catholic) and Beata Ankonga (a Lutheran) were legally married in 2005, but only sought the blessing of their respective churches a year after the death of Indongo’s estranged wife, Kordura GwaMbeno. This could not be done while the estranged wife was still alive because the Catholic Church, where their marriage was contracted, permits no divorce. According to the Catechism of the Catholic Church, sacramental marriage can only be dissolved by the death of one of the spouses. Additionally, Indongo had to be granted special dispensation from his Catholic bishop that allowed him to wed his new wife in the Lutheran church.